Saltillo Poncho, Hispanic. Date and place of collection unknown. Gift of Miss Isabella C. Freeman and Mrs. B.H. Buckingham. Acquired by the Smithsonian Institution in 1927. Department of Anthropology, National Museum of Natural History, Smithsonian Institution, cat. no. E334965, acc. no. 00096010. Dimensions: 97 in. (warp) x 51 in. (weft); fringe = 1 in. on either end. Technique: Plain tapestry weave. Two pieces sewn together with opening in center. Thread count: Warp = 17 /in. Weft = 32/in. Fibers: Warp = 2-ply commercial cotton. Weft = 1-ply commercial wool yarn, white, red, pink, yellow, black, green, blue, Z-spin. Design: The central motif is a large serrated diamond in red, patterned with small diamonds in all colors. The background is white patterned with very small serrated diamonds in all colors. 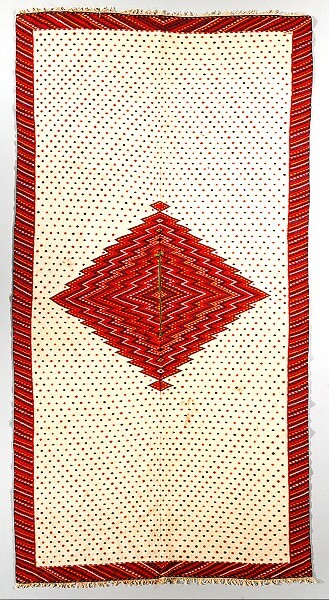 The entire poncho is framed with a red border patterned with diagonal stripes and small diamonds in all colors. The opening for the head is trimmed with green ribbon.